My family and I were able to take in an Indianapolis Indians baseball game last night. It was part of my son’s baseball league event and there was a little baseball clinic that the Indians coaches and players did that allowed the kids to come out on the field and practice various skills with the players. With all of that going on there was obviously a proliferation of kids in the stands. From the point I started counting, the kids in front of us got up from their seats and tried to exit their row 74 times. This required a tall friend of ours to get up every time. The kids got up to ask their parents (sitting a row ahead and on the opposite end) questions, go to the bathroom, talk to someone else and who else knows what for all of those events. Are the parents paying attention? Do they care? At one point if I thought to myself that if my son were talking to me and giving me the looks this boy was giving his dad, the game would be over and there would be a list of other removals of privileges and perks from his life. One particular demand from the boy, in a stern voice, with face Â tightened and teeth bare he said “GET ME SOME FOOD!” The boy would have been lucky to eat another morsel of food the rest of the day if he were mine. I’m not really a fan of people telling other people how to parent their kids, but man was this unacceptable behavior. Am I wrong? Should I have said something directly to the kid? To the parents? Perhaps I should post this question on the Indy Dads website. 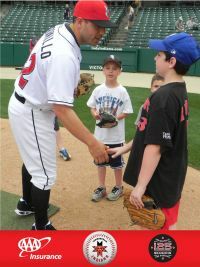 Photo: Picture taken by Indians staff photographers and shared for free from their website. Very cool service!